Preeclampsia is a maternal health condition that sometimes occurs in expecting mothers in the later stages of pregnancy. Approximately 8% of all pregnant women will be diagnosed with preeclampsia at some point during their pregnancy. Preeclampsia is a progression, as the name suggests, of eclampsia which and refers specifically to convulsions or coma in conjunction with preeclampsia. This can be life-threatening. The diagnosis of preeclampsia is presumed if there is eclampsia, even where signs and symptoms of preeclampsia go undiagnosed before the onset of seizures. 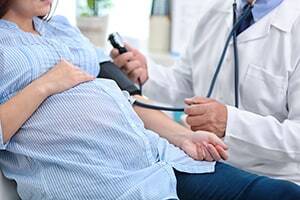 The characteristic symptoms of preeclampsia are maternal hypertension (high blood pressure) and high protein levels in the urine which are triggered by changes in the body during pregnancy. But these symptoms are harbingers of preeclampsia, not the causes of the syndrome. Preeclampsia is likely caused by from abnormalities in the placenta that feeds the fetus with blood and oxygen. These placental abnormalities often develop in the very early stages of pregnancy, when the vasculature of the placenta is still inchoate. Preeclampsia symptoms also include swelling and rapid weight gain. Severe preeclampsia is the presence of new-onset hypertension and proteinuria accompanied by central nervous system dysfunction (headaches, blurred vision, seizures, coma), marked elevations of blood pressure, severe proteinuria, oliguria or renal failure, pulmonary edema, hepatocellular injury, thrombocytopenia, or disseminated intravascular coagulation. Particularly severe cases of preeclampsia can cause more serious issues such as low platelet levels; breakdown of red blood cells; or impaired kidney and liver functioning. Preeclampsia almost always occurs sometime after week 20 of the pregnancy, with most cases developing during the middle or end of the 3rd trimester. What happens is the preeclampsia causes the blood vessels to constrict. The result is high blood pressure and a reduced blood flow that can affect organs in the mother's body, including her liver, kidneys, and brain. What can you do about preeclampsia? High-quality pre-natal care is critical to effective diagnosis and careful management of preeclampsia. Doctors need to ensure that appropriate consultation by specialists is performed and documented as to potential ongoing signs and symptoms of preeclampsia. Otherwise, there is a foreseeable probability that ongoing and undertreated preeclampsia will progress to eclampsia and debilitating and/or fatal injury if not resolved. Accordingly, the standard of care is to have a low threshold for treatment and to treat promptly and aggressively, particularly in a patient with symptoms of severe preeclampsia. Preeclampsia creates an increased risk of birth injury, newborn illness, and even fetal death. The Preeclampsia Foundation estimates that preeclampsia and related hypertensive disorders during pregnancy are responsible for 500,000 infant fatalities during childbirth every year. The exact physiological causes of preeclampsia are still not fully understood. Research into the underlying cause of preeclampsia is still ongoing but we still only have unproven theories. The most accepted theory focuses on the placenta and suggests that preeclampsia develops in 2 stages. In the first stage, the placenta produces certain excess proteins that get released into the mother's system. The second stage occurs when these excess proteins from the placenta trigger abnormalities in the mother's blood and cardiovascular system which eventually lead to hypertension and other symptoms of preeclampsia. The excess proteins from the placenta are called antiangiogenic proteins. Although researchers have a good idea of how and why these antiangiogenic trigger preeclampsia, what is less understood is why the placenta of certain pregnant mothers overproduces these proteins. The continuing uncertainty about the exact causes of preeclampsia makes it impossible to diagnose preeclampsia in advance. However, there are a number of well-known maternal risk factors which can be used to identify pregnant mothers who are more likely to suffer from preeclampsia than others. The most reliable risk-factors for preeclampsia are maternal obesity prior to and during pregnancy; older mothers (over 35 years); mothers with a prior history of hypertension; and diabetes. Preeclampsia is also more likely to occur if it is the mother's first pregnancy. Multiples (i.e., twins, triplets, etc.) also make preeclampsia more likely to occur. One thing we do know is that placental factors are believed to be the cause of preeclampsia. How do we know this? Delivery of the placenta will resolve the maternal symptoms of the disease. So the treatment for pre-eclampsia is delivery of the baby and all products of conception. Until that is done, the pre-eclampsia will not resolve. High Blood Pressure: high maternal blood pressure (hypertension) during pregnancy is the most significant indicator that preeclampsia may be developing. For women without a prior history of high blood pressure, hypertension during pregnancy is usually defined as blood pressure in excess of 140 systolic or 90 diastolic. The criteria are different for expecting mothers with higher or lower blood pressure prior to pregnancy. A diagnosis of preeclampsia usually begins with 2 separate high blood pressure readings taken 4 hours apart. Proteinuria: abnormally high levels of protein in the urine (proteinuria) is the second key diagnostic indicator of preeclampsia. Normally these proteins remain in the bloodstream or get filtered out by the kidneys and never appear in the urine. However, preeclampsia temporarily disrupts this filtration system. Proteinuria is easily identified by a simple urine test performed in-office during prenatal checkups. Swelling (Edema): the most noticeable physical symptom of preeclampsia is often swelling. The problem is that swelling is a normal occurrence that most women experience during pregnancy, particularly in certain areas such as the feet and ankles. This is normal. The type of swelling caused by preeclampsia is known medically as edema and is caused by the buildup of fluid. Swelling in the face, around the eyes or in the hands is not normal and often a sign of underlying issues such as preeclampsia. Headaches: headaches are another notable symptom some women with preeclampsia experience. Headaches triggered by preeclampsia are often very severe, like migraines, and develop suddenly. Excessive Weight Gain: of course all women naturally gain weight throughout their pregnancy. However, a sudden excess of rapid weight gain can be an indicator of preeclampsia. The reason for this is because preeclampsia causes damage to blood vessels which permits more water to leak into body tissue and stay there instead of being passed through the kidneys and discharged in the urine. Weight gain in excess of 2-3 pounds in a single week should be a red flag. Tominaga T.: Accommodation of the human placenta to hypoxia; Page EW; Am J Obstet Gynecol, 94 (5): pages 679-691 March 1966. Kayani SI, Walkinshaw SA, Preston C: Pregnancy outcome in severe placental abruption. BJOG 2003 Jul;110(7):679-683. W. L. Bigbee, et al; Impact of Maternal Lifestyle Factors on Newborn HPRT Mutant Frequencies and Molecular Spectrum-Initial Results from the Prenatal Exposures and Preeclampsia Prevention (PEPP) Study, Mutat Res., December 1999; 431(2): 279-289.